Grand Caribe Belize is a luxury Caribbean resort in Belize located only 2 miles north of San Pedro Town on the island of Ambergris Caye. 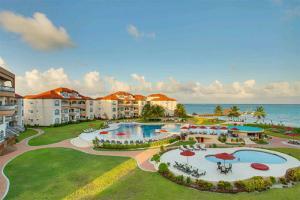 Grand Caribe Belize has a large selection of one two, three and four bedroom condominiums. All condos are spacious, beautifully furnished and feature fully equipped kitchens. In addition to the exquisite view of the Sea, the units also feature outstanding views of the pools and our well-manicured grounds.